FYI: The multiplication key on the keyboard is the asterisk [ * ] key. While researching the information needed to create an online algebra calculator for my site, I stumbled across an amazing math problem solver. But even more amazing than the calculator itself, was when the creators offered to provide a miniature version of their calculator for free to my site's visitors. Well, since I couldn't create a calculator anywhere close to the one I discovered, I decided to accept their offer instead of trying to build one myself. At first I simply included a copy of the calculator on my existing math calculator pages. However, after several months of getting nothing but positive feedback, and finding it invaluable when helping my then 15-year-old to do his math homework, I decided to give the calculator its very own page. Ta-Da! 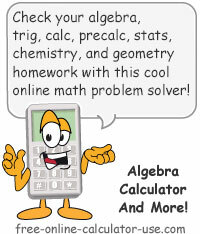 Now you can bookmark and access this online problem solver directly anytime you need to check your (child's) work when solving basic math, algebra, pre-algebra, trigonometry, calculus, precalculus, statistics, or chemistry equations. Select the type of math you will be performing (Basic Math, Pre-Algebra, Algebra, Trigonometry, Pre-calculus, Calculus, Statistics, Finite Math, Linear Algebra, or Chemistry) from the drop-down menu (stacked bar icon). Using the built-in keypad, enter the math problem you wish to solve, then click the paper airplane icon that will appear to the right of the entered problem. If the problem was correctly formatted the answer will appear in the scrollable area above the paper airplane icon. Note that if you are unsure how to enter a problem, tap the stacked dots icon in the upper right-hand corner to see a list of example entries. If you would like to view the step-by-step solution, tap the "Tap to view steps ..." link. This will take you to the Mathway website where you can subscribe to the premium version of their calculator ($19.99 per month, cancel at any time). Using the built-in keypad, enter the problem you want to solve in this area. Select the appropriate topic and then click the paper airplane icon. Clicking the Tap to view steps ... link will take you to the author's site where you can subscribe to the premium version of their math problem solver.